a tiny lil&#39; obsession of mine! a tiny lil' obsession of mine! I always start talking Easter and thinking Easter really early because I feel like every year the day itself arrives waaaay too soon and before you know it, the store shelves are barren and the ebay auctions dwindle away. You real deal ebayers know that the great Easter stuff was probably bought up two days into the new year. As far as Easter Sunday goes for me and Aaron the day is never the same. Neither of our families has a big get-together, nor do we have a special meal etc... We always kind of dictate the day according to weather. Here at the Jersey shore the boardwalks and amusement parks use Easter Sunday as their season opener. If the weather is fair we'll head down to Point Pleasant and get some deep fried oreos, ice cream, pizza, play a few rounds of skee ball, maybe mini golf and then take our annual snapshots in one of the old school black and white photo booths. If the weather is really nice the crowds at the boardwalk are amazing! Even if the weather is bordering on bad the people still come out in droves and all of the little girls are buying those red Lifeguard sweatshirts to wear over top their Easter dresses. Though this year might be different. We've got the amazingly adorable little nephew Adam and it's his first Easter. On Christmas we saw him in his little penguin suit. (it was sooo cute but he hated it and wanted OUT just as soon as mommy put him in it!!) Maybe now they've got a little bunny suit for him! Anyway, I guess we'll let little Adam call the shots for this Easter. We're babysitting him this Saturday so we'll ask him then what the plans for Easter are. He doesn't talk yet so it might be a bit of a challenge. We'll take some pics of the little munchkin on Saturday and I'll post them Sunday. Which reminds me... You guys should definitely try to post some Vintage Kitchen Swap pics in our Fickr group! (Flickr: Jenny Holiday's Vintage Kitchen Swap 2007!) Some very lucky gals have already recieved some incredible goodies! Go have a peek! For you guys that aren't tech savvy, believe me, it's easy...and it's free! This'll serve as our little online photo album for swappers. You can even post some pics of you out and about shopping for the stuff and/or your little work table set up if you're doing some crafting. 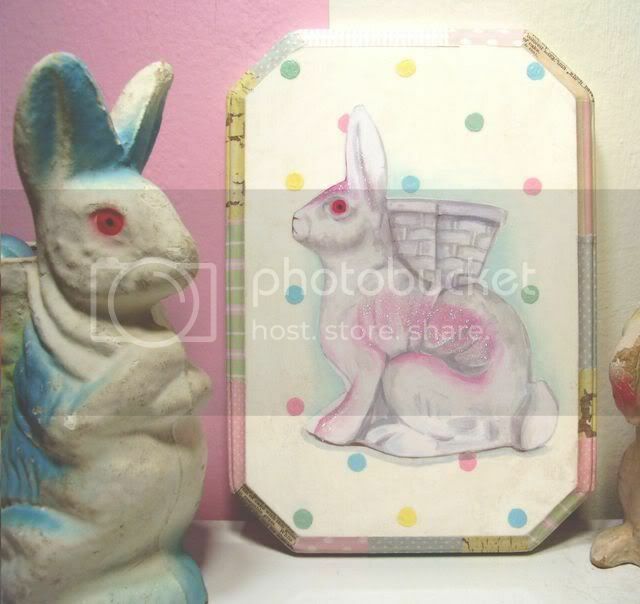 And lastly, speaking of crafting, I have to mention the photos you see here of our new Paper Mache Rabbit Plaques. Those have been on the drawing board for a year but you know how full that back burner can get! Well here they are finally and they are our new faves by far. We just love the color palette and you can see that our paintings are modeled directly from our prized collection of vintage paper mache bunnies. We listed them today! Hope you like em'! Those placques are adorable ! You have a whole collection of the paper mache bunnies ? I only have one ,but I just cincidentally posted a pic of him and my vintage German paper egg collection. That is very sweet of yo to baby sit little Adam,youdon't know how badly we parents need time off! I love the vision of little girls dresssed up but being cold and having to wear a red sweatshirt! I love all your new Easter items! The ornaments are the cutest things ever!!!! Beautiful work, as always! I have to ask.... what exactly are deep fried oreos??? You're bunnies are yummy! Too too cute!!!!!!!! It's soooo fun to see pictures of the swap! 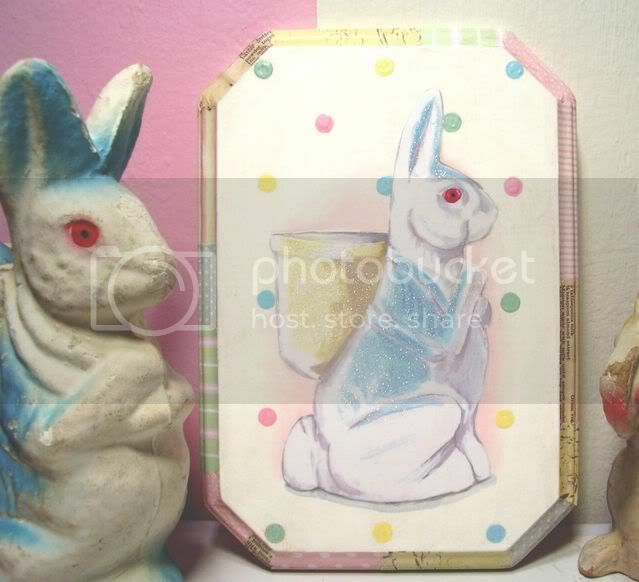 Great stuff:) I saw a vintage paper mache rabbit just like this at an estate sale today. Perfect condition...but $50! Yikes..I had no idea they are worth that much. Tomorrow it should be half off...not sure if it will be there. Alright, so Mary Smilove (http://marysmilove.typepad.com) and I are sitting here at the shop (sweetpeas and snapshots) just adoring your style; your cupcakes (a shop signature), your images (always fresh) and your writing (never dull.) Thank you for keeping such an interesting blog up...and for the inspiration! I love the bunnies. That's my daughter's nickname. So i kinda hoard the bunny stuff too! Jenny, these are awesome! They look exactly like the original paper mache pieces. You and Aaron are very gifted. Jenny!!!! Your bunny plaques are AMAZING!!!! Love them!!!! Hello, so sorry I have just sent you a hello via your eBay shop, your blog site is amazing, Laura and I adore Easter as well, it is the colour and the weather, here it is getting cooler and we are excited! The thing I love most about your blog is your exclamation marks!! I use them all the time to and people want to know what I am so excited about all the time that I must exclaim! Hmmm life I suppose, haha.